GMB Wheel Bearing Hub Assembly 00-01 Dodge Ram 1500 RWD GMB Wheel Bearing Hub Assembly 00-01 Dodge Ram 1500 RWD, Wheel Bearing Hub Assembly 00-01 Dodge Ram 1500 RWD, Wheel Bearing Hub 00-01 Ram 1500 RWD, Wheel Bearing Hub 00-01 Dodge Ram 1500 RWD, Wheel Bearing Hub Dodge Ram 1500 RWD, Wheel Bearing Dodge Ram, [GMB 720-0355 Wheel Hub] - $65.99 : 3rd Strike Performance, Your Source for Late Model MOPAR Performance Parts and Accessories! 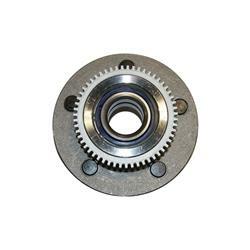 Premium parts without the premium price--GMB wheel bearing and hub assemblies should be your replacement choice. You can do the work yourself, but dealership prices will blow your budget. GMB parts deliver the form, fit, and function, as well as quality standards to meet and exceed your OE expectations. Their assemblies are precision-engineered with the right mix of ruggedness, temperature endurance, and materials to afford smooth, long-lasting operation on your vehicle. They are factory-sealed to eliminate contamination. GMB wheel bearing and hub assemblies provide quality and a perfect fit for your vehicle and your wallet.